See you at the Tour de Frack on November 11th in Greeley! Please join 350 Northern Colorado and our allies for an educational tour about the risks and harms of hydraulic fracturing (aka “fracking”) in our Northern Colorado communities! Transportation within Greeley is included with the tour. Registration is required by November 6th! Event sponsors include 350 NoCo, UNC Environmental and Sustainability Studies, UNC Department of Geography & GIS, and UNC Earth Guardians. Team History and How to Get Involved! If you would like to get involved and be added to the 350 Northern Colorado email list, please contact Doug at dhender@gmail.com. 350 Northern Colorado got its start on Sunday, December 14th, 2014, when a roomful of almost 40 activists from Larimer and Weld counties gathered at the Old Town Fort Collins Library. T he group included Colorado State (CSU) and Front Range students and professors, artists, scientists, agriculture students, writers, fractivists, techies, faith leaders, renewable-energy advocates, high school students, and more. The eleventh chapter of 350 Colorado, 350 Northern Colorado was convened by Shelby Robinson, who was spurred to start the group after joining the New York Climate March this past fall. Her initial email asking about interest got 60 responses. 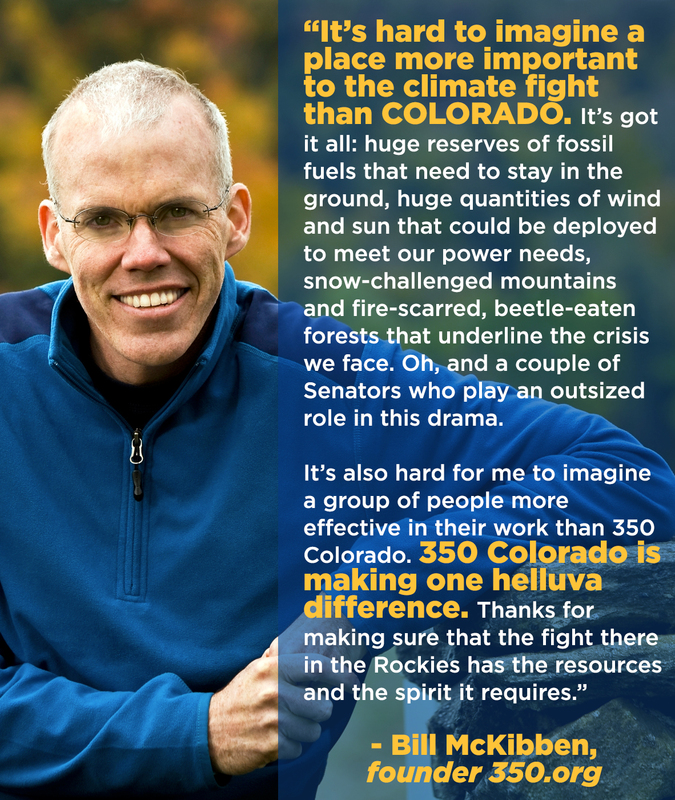 350 Colorado Executive Director Micah Parkin detailed the history of 350 Colorado in the state, and the three main tenets: movement building, opposing extreme energy, and supporting local solutions. 350 Northern Colorado members then brainstormed a wide variety of campaigns to work on; chief among them were stopping fracking in the area (and the state), advancing the Fort Collins Climate Action Plan goals, and resistance to Keystone and Tar Sands development in neighboring Nebraska and Utah. Other goals: addressing climate change through divestment from fossil fuels and instituting population measures, stopping subsidies to fossil fuel companies, promoting local food and renewable energy, and encouraging low-carbon transportation. There was a lot of knowledge, a lot of local experience, and a ton of potential energy. All the campaigns are still forming – come join us! For meeting info please email Doug at dhender@gmail.com for details & join us on Facebook.